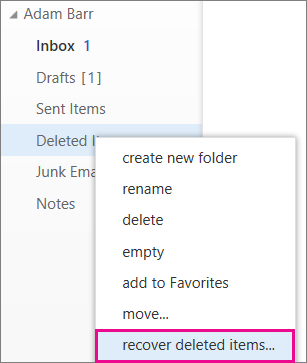 When you accidentally delete an email message, contact, calendar item, task or entire folder from your Office 365 email account, you can sometimes recover such items. For example, you can recover deleted items if they still remain in your Deleted Items folder. You also have 14 days to recover some items even after the Deleted Items folder is emptied. 1. Sign in to your Office 365 email. 2. 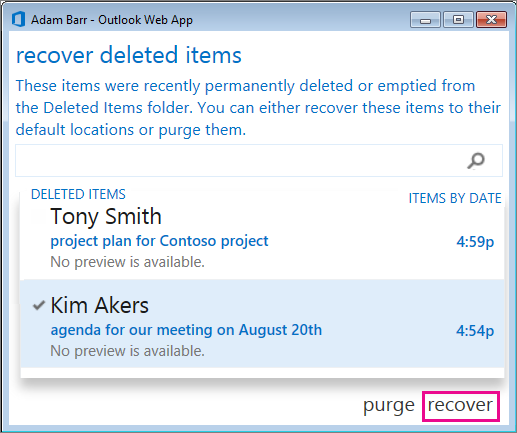 In your email folder list, right-click Deleted Items, and then click Recover deleted items. 3. Select the item you want, and then select Recover. The item will be moved to its default location. Messages will go to your Inbox, calendar items will go to your Calendar, contacts to your Contacts folder, and tasks to your Tasks folder. You can also purge items that are shown in the Recover deleted items box. Select the item, and then click Purge. If you purge an item, you won’t be able to use Recover deleted items to get it back. Purging a message won’t remove it from any system backups that were made before you purged it.